In recent years, the cheaper, no frills airlines and now, some of the major carriers, have been telling us that if we want to take two or three bags onto a plane, then we have to dig deep and pay for the privilege. 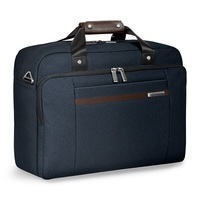 As a consequence, we are all starting to carry less and less luggage, and companies such as premium travelware company Briggs & Riley, are starting to produce bags that are small enough to not only go in the overhead locker, but can even fit under the seat*. Kinzie Street Cabin Bag: From the new Kinzie Street collection, this is part day bag, part business brief and part overnighter. The Cabin Bag which is made of a tough coated fabric that provides durability and moisture resistance, is a hybrid piece that is the essential companion of any urban professional. It offers easy organisation for tech gadgets – including a laptop up to 12.6” – in a relaxed and casual style. Measuring 30.5 x 41 x 18 cm and available in grey and navy, the bag retails for £209. Baseline Medium Duffle: When simplicity is what's needed, look no further than the Medium Duffle, the latest addition to the best-selling Baseline collection. The lack of bells and whistles doesn't mean that this bag isn't just the ticket when you just need a quick and easy packing solution for one or two nights; its roomy interior keeping everything within easy reach. The bag is made of Briggs & Riley’s renowned ballistic nylon which resists wear, moisture, dirt and abrasion. Available in black or olive, the bag measures 33 x 51 x 27 cm and retails for £199. Baseline Framed Weekender: Another new addition to the Baseline collection, the Framed Weekender holds anything and quickly snaps open for easy packing and access to contents. It's the perfect bag for a quick bank robbery getaway (though we're sure you'll only use it for legitimate reasons!). Also made of ballistic nylon, the bag is available in black or olive, measures 34.5 x 46 x 23 cm and retails for £239. Briggs & Riley products are available online at johnlewis.com, at selected John Lewis Branches, Harrods, Selfridges, Case London and leading independent retailers (a full list can be found at briggs-riley.com/luggage-stores/international/). *Briggs & Riley recognises that each individual airline reserves the right to dictate which bags (if any) are permitted onto an aircraft as carry-on luggage, for storage either under a seat or in an overhead locker.